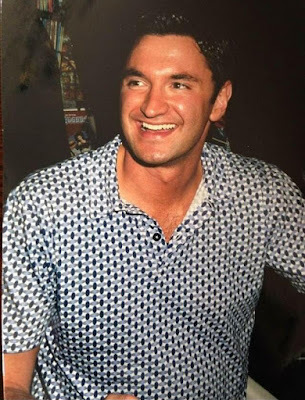 Wouldn't it be awesome to have all messages of everyone who loves and remembers Andy in one place, one and only video?. 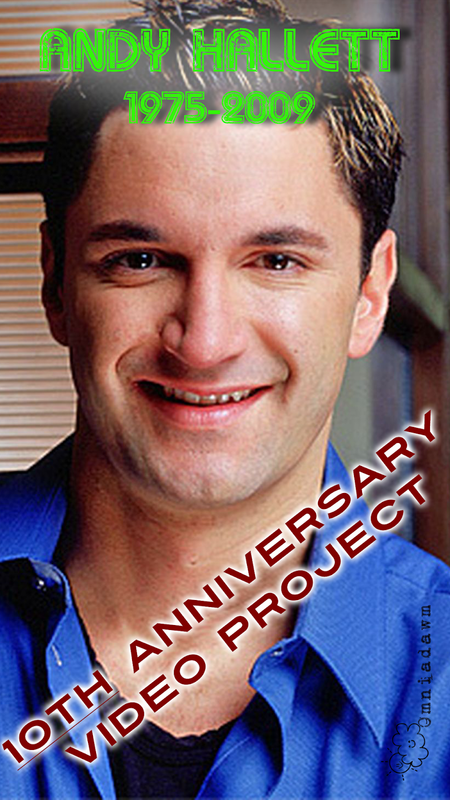 Join the video project for Andy's 10th Anniversary. 15 secconds video with message. Send everything to my email before March 22nd 2019. Feel free to share this with everyone you know! Time flies. A month passed by since I last wrote in here. Life's been busy and bright! But I am sure you don't want to read about me, but to know about Andy and my life around him. I actually have few things to share but first things first. I just love so much when this happens!! 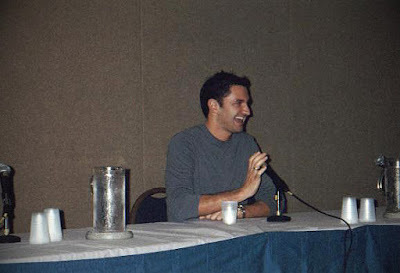 The photo was taken at the Buffy Posting Board Party in L.A. in 2001 . "Andy was such a delight! I told him I thought it was Quentin Tarantino under all that makeup the first time I saw Lorne on Angel, and he thought that was so funny he had to tell his manager, who was also there that night. " 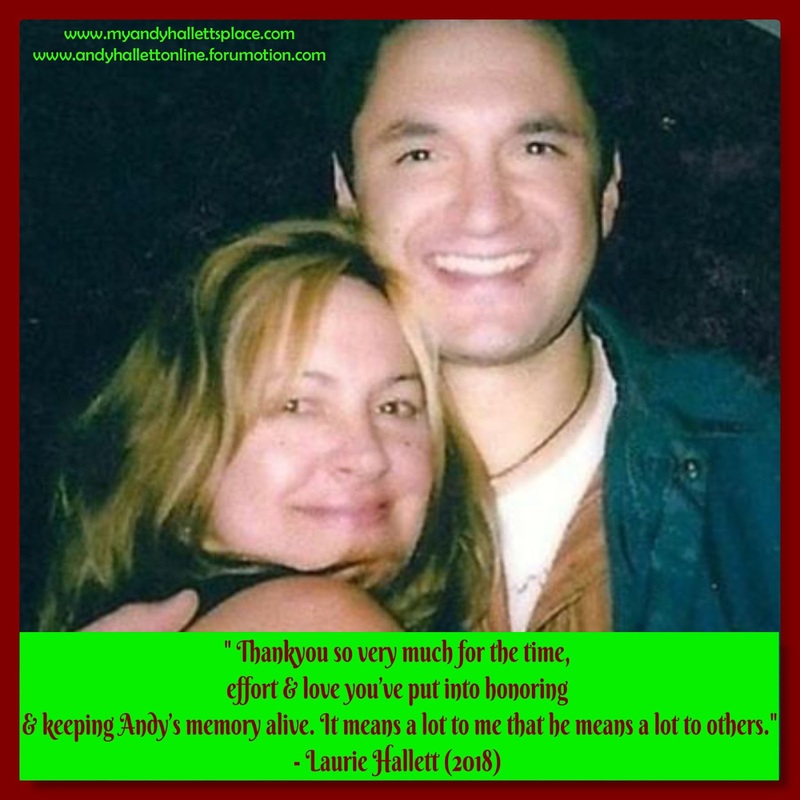 Thank you Wayne for sharing this with me and all Andy fans. What an awesome photo and moment! If I have to be honest I have imagined this year quite a bit different. Then again I never imagined my life would have changed this way. Life has changed so much in these two years. Life will keep changing in the next two years. Anyway, since the year started I felt this would be a good year. I would get all my goals done, I would make all my dreams come true. Since I am going to be very focus on my new business - still trying to find my place in this world though I thought I have already found it!- , I decided to make two major projects on this first half of the year. (On the second half I am doing two Lorne Marathons and a Watch Party). If you have anything to add to this page (info, photos, etc. ), please feel free to go to the Forum here and share with everyone there! 🌈 Find 2 moderators for the Andy Hallett forum and make it work! I know I can't do it alone so I need you in this! Sharing, commenting or recommending this place to people you know. Please, feel free to share the Photo below anywhere. 📌 Video Project with all your messages to Andy (remember to include Name and Country). Email me or post it here (Forum). Feel Free to post these photos on all your networks. 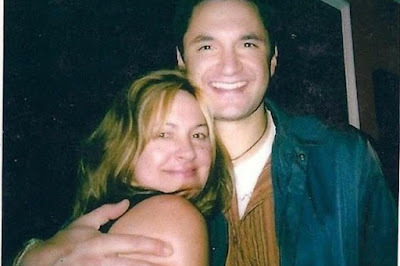 If you want to help reaching my goals or/and you love Andy, Lorne, Angel, Buffy (etc. 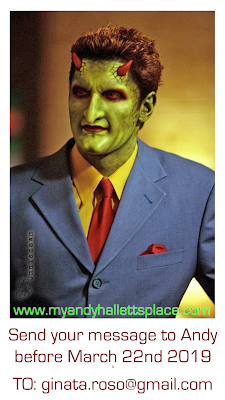 ), please share this as many times as you can, comment and I hope to read you soon around the Andy Hallett Online Community. Remember when a while ago I used to write about those songs it would remind me to Andy?. I got so busy I stopped paying attention to music's messages. Happy Second Anniversary.... to me! My heart felt like it find a little light that flooded it all. It felt like it was back in one piece. For months it's been like that. I'm not sure it healed already. Untie the Poll! : Next Event Watch And Comment Episode. In case you don't know How this works. Every month I do a watch and comment episode. So you must get your DVDs ready!!! Check this site and the forum for the date and full details. Once the day arrives, make sure you are logged in on the Forum. At the bottom of the page you will find a chatroom. 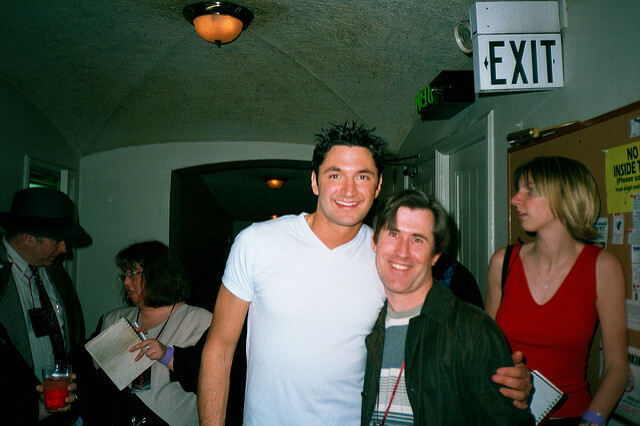 Join me there for a proper Andy Hallett and Lorne Tribute. This month's event is very special since it's this site's 2nd Anniversary so I hope you all join me in this. Other reason why this special. You all chose this month's event! Get everything ready because we are having big party this time! Which episode would you like to watch and comment with me next month? Save the Date: Sunday 25th November 2018. 5.30 pm UK time. 6.30 p.m. Berlin Time, Noon NYC Time, 11.30 am. L.A. time. Untie the Poll!! Click here to choose your fave episode and I see you all at the Forum's chatroom next November 25th to watch and comment any of those 2 episodes (Hush or Spin In The Bottle). I had a dream tonight. I fall asleep at a foreign bed, I woke up into another reality. Everything was so bright, so clean, so peaceful. I went out of the bedroom. I heard a water sound on the room next door. I looked out the doorstep and there you were. 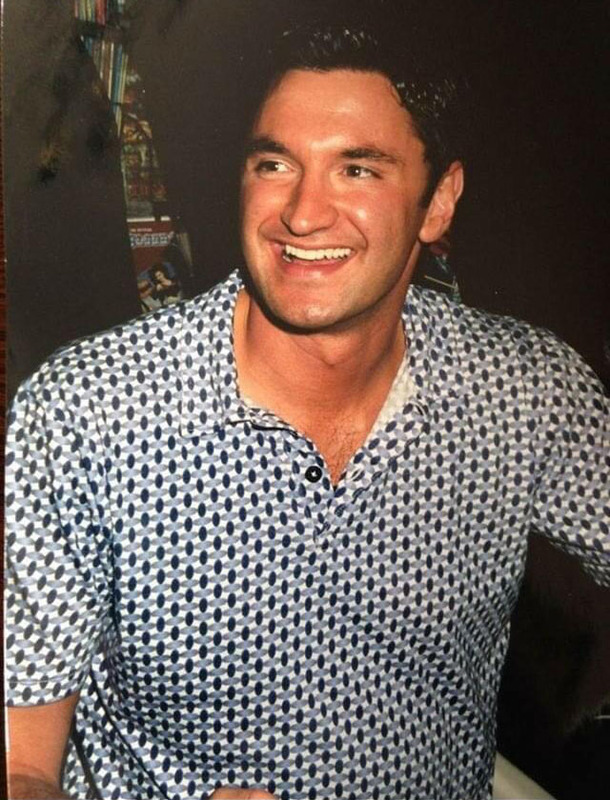 Big smile, full of joy and looking like you were never gone. When I woke up I could only remember how much I miss you. The peace your smile always provides me, real or not. Thank you these magic moments. Real or not. 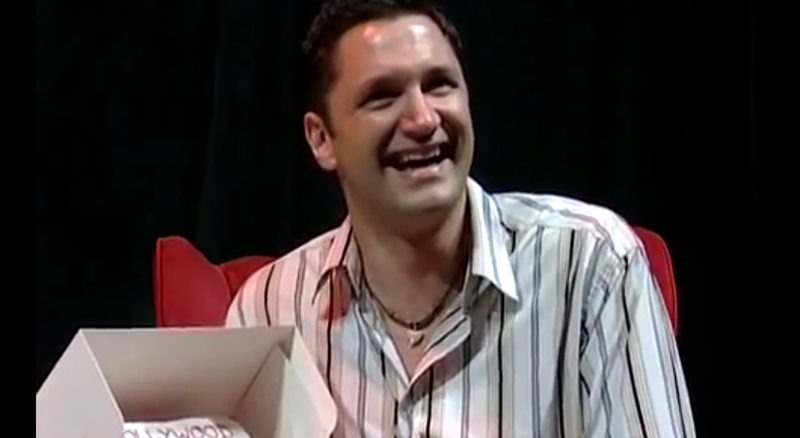 It's been long since I last did a Lorne Marathon so I can't wait to the next one. I've been having a busy time lately. Trying to set up another business, trying to find the place I belong in the world is never easy. That's why ocasionally I find myself lost in the middle of everything asking myself if this is worth the fight. Luckily, the answer is always been yes. As human being I need my time off, I need to serve my time to something else more than work, relaxing my mind from the daily basis and get some fun out there. Or rather, out here. Since the very first moment I "met" Andy two years ago, my life's been like a bit of a rollercoaster, he's been the star to follow when I felt nothing fit in my world. My life seems a bit more calm these days but as busy as then. Andy was then the place to hide and be myself, Andy still is the place where I come back to hide, be myself and relax in the beauty of his heart, voice and face. 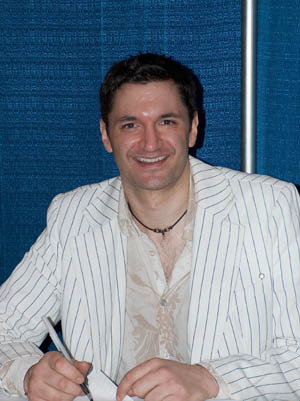 Once said this, please, join me for some Andy Hallett fun, some bit of tribute watching some Angel episodes. 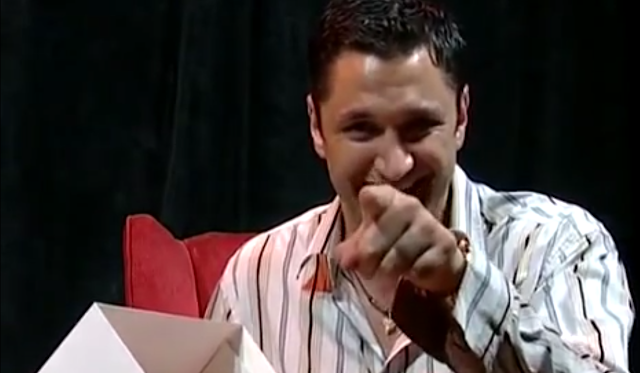 Get your DVDs Ready >>>> Watch and Comment at the Forum (You need to log in to chat with me !). Click here to visit the Forum and Join now! Next Sunday October 21st 2018 at 5.30 p.m. UK Time, 11.30 a.m. Boston Time, Noon Buenos Aires Time, 8 a.m. L.A. Time, 2 a.m. Melbourne Time. I had a meeting downtown where I would meet a client of mine. I was ready to go and win everyone over in that meeting but for some reason I didn't get a taxi cab to drive me to the place. I instead took the underground. So then something magic happened. When opening the entry door to the undergroud, a guy was waiting for me right there, holding the door. When I looked him in the eye something familiar I found. Not sure what it was but he was definitelty very look alike. His eyes, his mouth, his face, not his nose of course and neither his high. But was it a coincidence? Was a sign from up above?. I believe it was somehow and that evening everything felt different.